Like mentioned in the Lib-V release announcement a week ago, it has taken us time to come with 5.0 SP2 support in our products. But now we are happy to tell you that also our premier App-V package editor/viewer, Application Virtualization Explorer, has reached a new major 4.0 release that includes that long-awaited SP2 support. 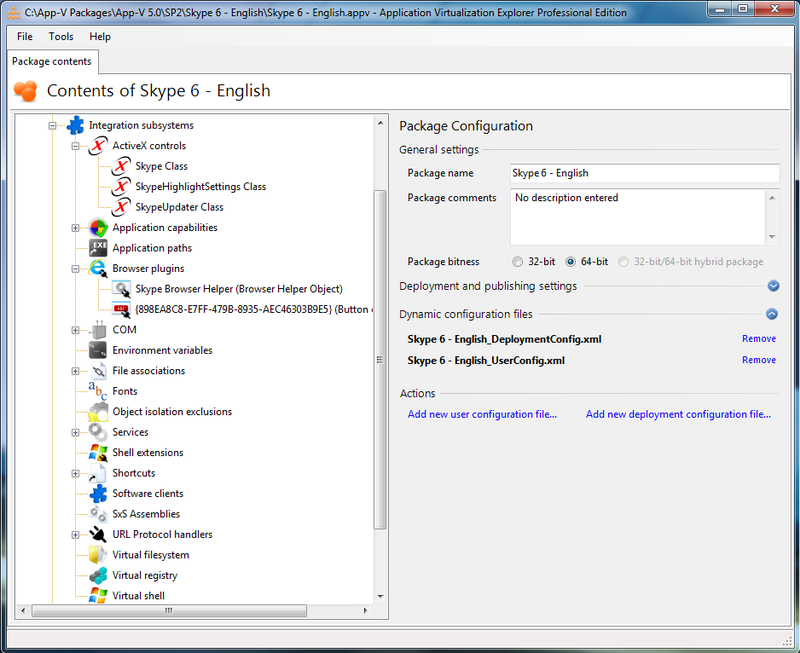 SP2 changes mainly include a support for those four new application extensions (/integration subsystems) that Microsoft calls with a term of “dynamic virtualization” in the App-V 5.0 SP2 Client’s configuration settings. And off these new extensions items, it’s probably the Explorer Shell Extensions that are most requested application integration features over the years, even going back in to the SoftGrid 3.X days! In AVE, you will notice that the new subsystems behave a little bit differently from all the other – previously available – integration subsystems. Namely, it is not possible to enable/disable the subsystems either for the base package (i.e. .APPV file) or per dynamic configuration file -basis. The reason for this difference is unknown, but for what ever reasons Microsoft when releasing SP2 decided to leave all four new subsystems out of the configuration files. So you effectively cannot control that, for instance, shell extensions would be available for certain users with certain user configuration file, while other would have them. With AVE, what you can do is to remove those extensions items that you do not want to publish at all. Of course, doing so will remove them from the base package itself so it’s a one-way street in that regards. Hopefully Microsoft will add possibility to control new integration subsystems in more granular manner in some future App-V release! We also added support for that VFS Full Write Mode setting that was added in the Service Pack 2 Hotfix 4 few weeks back. You can control the setting from the Filesystem -node in the AVE when you have package open. Just remember to save the package in SP2HF4 format to actually write out the setting to the modified package. In addition to technologies added by Microsoft to the core App-V 5 package format, we have improved the AVE’s operation otherwise as well, not to mention squashing some bugs along the way! Search functionality is now available for 5.0 packages (as it has been for “Classic AVE” already before) and you can use unified search to search virtual filesystem and virtual registry in one go. And, should you feel so inclined, you can now also modify the PVAD (Primary Virtual Application Directory). Not that we recommend doing so, although there seems to be no discernible effect on regardless what you set it for (or even the same for all packages!). So, we hope that you continue liking our Application Virtualization Explorer, as we have loved creating it! As usual, you can purchase a copy for yourself (and/or your organization) at our website at http://gridmetric.com/products/ave_editions.html. When I try to import a package that I edited with AVE 4.0.1 into SCCM 2012 R2 I get the error message: The specified file does not contain enough information to create a new application. Import failed. Unable to locate a deployment configuration XML file. Both configuration files are in the same folder as the appv file. Please send the problematic package to support@gridmetric.com and we can take it from there.